Update 2-14-2016: There has been some fixes around ports usage - see readme.txt for details. SPI is now demonstrated to work, and have been making progress in a CAN library. There are now 3 different 'versions' of the support files to use with different generations of the Arduino IDE, including the latest 1.6.7 w/o warning. The optiboot included has disabled any startup blinking of the LED - in case you happen to have Port 13 assigned to something other than an LED. Brown-out is set at 2.7v (same as the Arduino UNO), so you should be able to operate at 3.3v (take care of max clock frequency allowed when operating at lower Vcc - hence the 8Mhz versions). The fuses are also set to FORCE both the A and B outputs of the PSC controllers to a known LOW state upon startup / reset. (6 output ports: PSCOUT0, 1 & 2 - both A & B). The clock selected is one of: 16Mhz, or 8Mhz external xtal, or internal 8Mhz osc. For the 'core' support libraries, at this time I simply copied over the libs I modified in the v1.0.6 IDE port. I noted there had been a bit of cleanup with some of the 1.6.0 libs, esp around the hardware serial functions - but it does appear that the existing libs still function w/o problems. Going forward I will update the core lib functions as errors are found. 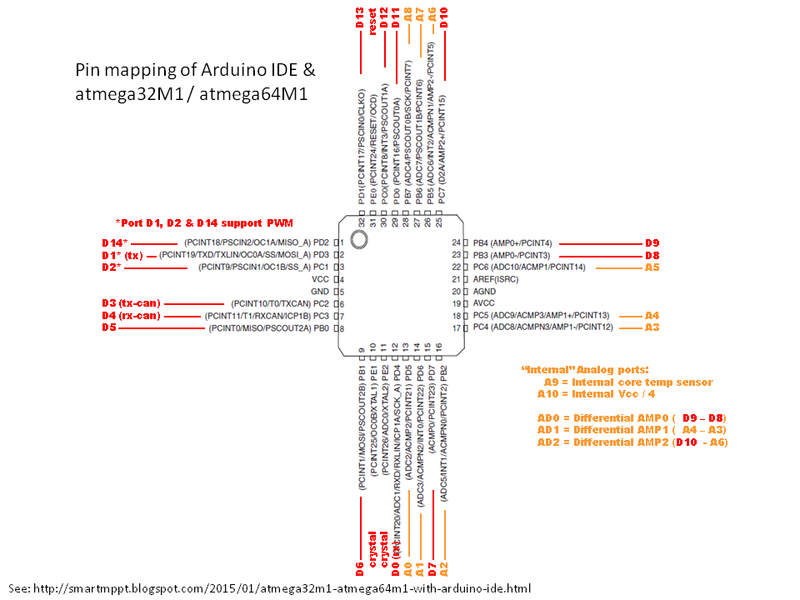 Refer to the graph at the end of this post for a mapping of the CPU pins to Arduino PORT names/numbers. Do make sure to check the Arduino Libs resource tab above for any updates. ATmega32M1 - 8Mhz internal osc. 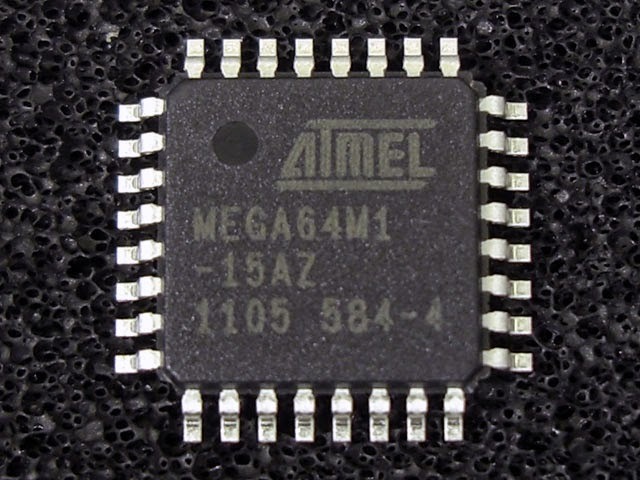 ATmega64M1 - 8Mhz internal osc. Enhancements to pinMode() and analgoReag() - Differential inputs. A few notes on the 1.6.0 release of the Arduino IDE. Overall I am very happy to see them include a newer version of the GCC compiler - with its direct support of both the ATmega32M1 and ATmega64M1 uC as well as a better optimizer resulting in perhaps a 5% code size reduction. It does appear they have also optimized the workflow of the overall tool some - I noted a bit better response / less delays when doing various tasks. However I am rather disappointing they did not upgrade some of the other tools - e.g. AVRDUDE and the OptiBoot code. You will still need to manually edit avrdude.cong adding in the ATmega32M1 and ATmega64M1 IDes, but at least now you can have both at the same time. And for Optiboot - they not only did not upgrade to the latest release, but they totally broke the toolsets needed to recompile optiboot under 1.6.0; it is a mess, with the only option to use a down rev 1.0.x release for the toolset and add in the latest source of optiboot source. This is what I did for the boot files needed in this porting. A final note: I have only TESTED this port using the ATmega64M1-16Mhz xtl, and 8Mhz Osc options; as that is the boards / CPUs I have at had. As folks use this if you find any issues with the porting I did, please let me know.